Kangra: The BJP is winning in Himachal Pradesh and did not need him to visit, Prime Minister Narendra Modi said at the first of two election rallies he held in the hill state today. He was in Kangra district which sends 16 of the state's 68 legislators to the state assembly. "I can sense the love you all have for the BJP. In fact, I was telling my colleagues, why do you want to send me? We are winning Himachal anyway. People in Himachal love their local BJP leaders so much that I am not required," said the Prime Minister, wearing a traditional Himachali cap. By his side was Prem Kumar Dhumal, who the party is projecting as its chief ministerial candidate in a departure from its usual practice in recent state elections, when it has projected no one for the top post and has sought votes for PM Modi's development policies at the Centre. The shift in strategy was impelled by infighting in the state unit, sources said, and also because party workers said they perceived a loss of momentum after the Congress announced that Chief Minister Virbhadra Singh would front its campaign again. The Congress had taunted the BJP saying it had no leader to project as chief minister. The Modi factor alone is not enough, the sources said. Local leaders are important to voters as are local issues. The party hopes the state will stick to its track record of not voting for the same party twice in a row for decades. Since 1993, Virbhadra Singh and PK Dhumal have alternated as the state's chief minister. In a vision statement it released earlier this week, the BJP has promised free pilgrimages for the elderly and a live telecast by public broadcaster Doordarshan of aarti from the various famous temples in the state. It has also said it will set up a commission called the 'Gau Sewa Ayog,' to ensure cow protection and to make "cow rearing profitable." A BJP government will also make policies to increase the number of cows in the state, it said. It is seen as an attempt to secure the support of the state's 20 per cent Brahmin population. Rajputs make up 28 per cent of Himachal's voters, but since both the Congress' Virbhadra Singh and the BJP's PK Dhumal are Rajput's, the community's votes are expected to split. Booth-level BJP workers say the cow protection and live aarti promises has been received with enthusiasm. "Of course gau mata is an issue. It's our moral duty to protect her. We are proud that Modi ji is supporting this cause," said a BJP worker Kanta Devi. By her side her colleague, Brahmi Devi, said, "Aarti and darshan are all very important aspects of our life." As important as employment and roads, if not more, she said to a question. PM Modi's visit to Kangra today was also part of the BJP's strategy to focus on the district which has the most assembly seats. 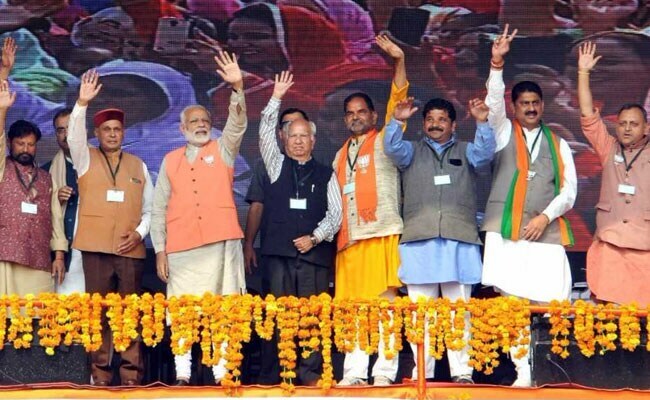 Of the 16 Kangra seats, the BJP had won only three in the last assembly elections in 2012. The Congress had won 36 seats in that election and the BJP 27. Mr Dhumal is from Kangra and the district will also see a maximum of the BJP's 40 star campaigners, including party chief Amit Shah. Uttar Pradesh Chief Minister Yogi Adityanath has also been rostered to campaign in the region.